Cliff Bungalow – Mission residents are actively engaged in their community and keeping them informed is our top-priority. Your Mission Statement is the official community newsletter, and covers community news and is published monthly to keep content current and relevant. Delivered to every household, apartment, and business, every resident is acquainted with the community’s most important information. The Cliff Bungalow – Mission community association attempts to guide development of the area, ensuring that it remains low density and restricting the construction of buildings over three stories. The community association was also responsible for the creation of the 4th St. Lilac Festival, Calgary’s largest street festival. Cliff Bungalow – Mission is close to numerous restaurants, shopping facilities as well as the Bow River and Lindsay Park. 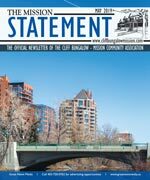 In the City of Calgary’s 2012 municipal census, Cliff Bungalow had a population of 1,936 living in 1,377 dwellings, a 1.3% increase from its 2011 population of 1,912. With a land area of 0.4 km2 (0.15 sq mi), it had a population density of 4,800/km2 (12,500/sq mi) in 2012. Residents in this community had a median household income of $47,126 in 2005, and there were 20.4% low income residents living in the neighborhood. As of 2006, 16.7% of the residents were immigrants. A proportion of 91.5% of the buildings were condominiums or apartments, and 72.2% of the housing was used for renting.